6 is the tastiest number, and for a good reason! J.Co is celebrating its 6th Anniversary in the Philippines, and here is their fantastic JCO Sweet 6th Treat/Promo! Get your stubs from 10am to 2m, Buy 2 dozens (1 pre-assorted dozen and 1 dozen of your choice) and get half dozen ALCAPONE for FREE! 1. Get half dozen of Alcapone donuts when you purchase 2 dozens of donuts for only P650. 2. One (1) pre-assorted dozen consists of 1 pc Copa Banana, 1 pc Katy Berry, 1 pc Choco Caviar Chocolate, 1 pc Mr. Green T., 1 pc Why Nut, 1 pc Oreology, 1 pc Meisisipi, 1 pc Glazzy, 1 pc Berry Spears, 1 pc Blueberry more, 1 pc Don Mochino and 1 pc Jcoccino. 3. The other dozen will be donuts of your choice. Only the following donut variants are available in the selection: Alcapone, Tiramisu, Oreology, Cheesecakelicious, Avocado Di Caprio, Jacky Chunk, Choco Caviar Strawberry, Green Tease and Coco Loco. 5. This promo is valid for dine in and take out transactions. Any advanced orders or bulk orders on the days of the promo will not be allowed. 6. Promo duration is from March 14 to 15, 2018, 10am to 2pm only. 7. This promo can be availed in all J.CO stores nationwide except kiosks and booths. 8. The promo cannot be exchanged for other items or discounts and cannot be used in conjunction with other promos. In the purchase of goods and services which are on promotional discount, the senior citizen can avail of the promotional discount or the discount provided under the Expanded Senior Citizens Act of 2010, whichever is higher. In compliance to, Section 4 of R.A. 9994, otherwise known as the Expanded Senior Citizens Act of 2010. What is the duration of the promo? Stubs will be provided by the store from 10AM to 2PM to those who are lined up on the promo line. No stubs will be provided past 2PM. Can I avail of the promo without the stubs? No. The stubs that are provided from 10AM to 2PM are essential to avail the promo. Will the promo be valid in all J.CO stores. All J.CO stores (except for booths and kiosks) will participate in the #JCOSweet6thTreat promo. Until when is the validity of the stubs? Stubs distributed on March 14, 2018 can only be used on March 14, 2018. The same goes for Stubs that will be distributed on March 15, 2018. The line will start in front of the J.CO store with a designated signage. How many dozens can I buy when I line up? Each customer can only purchase 2 (TWO) dozen donuts per transaction. Will there be a priority lane for Senior Citizen, PWD and Pregnant customers? Yes, a priority lane will be provided for SENIORS, PWD and Pregnant customers. 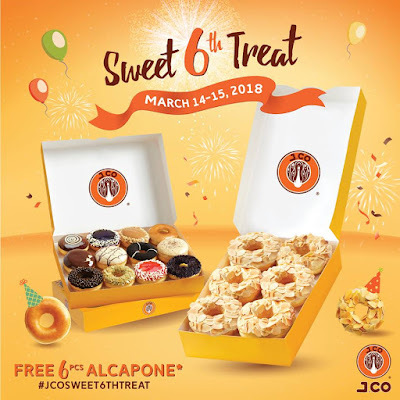 Can I use my Senior Citizen priviliges for the #JCOSweet6thTreat Promo? Seniors have the choice to EITHER avail the promo OR use their senior discount privileges. The romo cannot be exchanged for other items or discounts and cannot be used in conjunction with other promos. In the purchase of goods and services which are on promotional discount, the senior citizen can avail of the promotional discount or the discount provided under the Expanded Senior Citizens Act of 2010, whichever is higher. In compliance to, Section 4 of R.A. 9994, otherwise known as the Expanded Senior Citizens Act of 2010. Are authorization letters for seniors allowed? Card holders must be present. Authorization letters and/or proxies are not accepted. Can I make an advanced order or reservation for this promo? Advanced orders or reservations are not allowed on the days of the promo (March 14 and 15, 2018). Can I make a bulk order on the days of the promo? Bulk orders will not be allowed on the days of the promo (March 14 and 15, 2018).